Bromley Council are the land owners and local planning authority for all of Crystal Palace Park, that includes the NSC. The Mayor of London, through the GLA, are the long term lease owners of the Crystal Palace National Sports Centre (approx. 25 acres inside the park, 125 years lease from 2006). Both Authorities have separate new masterplans underway for their respective areas. Latest GLA draft design options and NSC masterplan objectives were shown in October 2018. See here for more details. 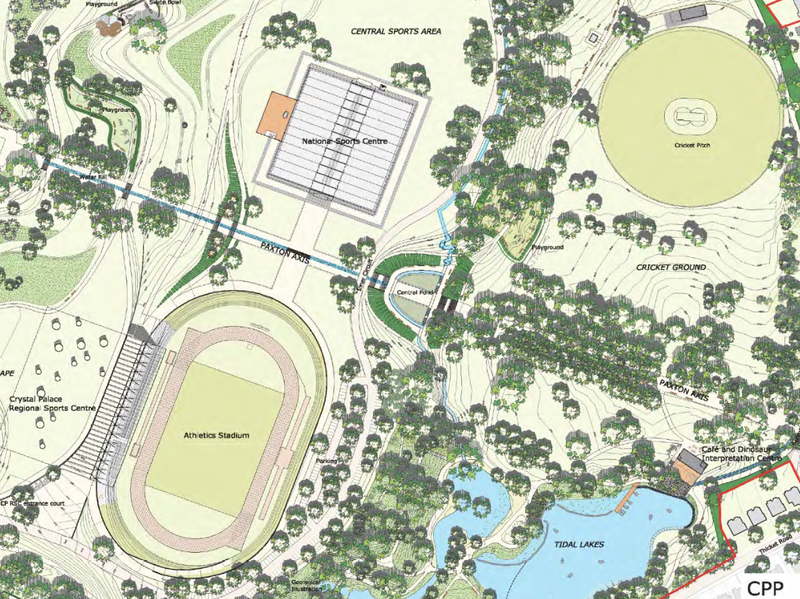 Read the Crystal Palace Park EIA Scoping Report – here. about the Regeneration of the park – here. The Environmental Impact Assessment (EIA) Scoping Report notes the scheme that was assessed in the 2007 is considerably different to the current masterplan, particularly in relation to the NSC and in the landscaping proposals. Click here for reports and latest information events form Bromley about the wider park regeneration. Click here for the March 2018 Regeneration plans . While the Council had anticipated submitting an Outline Planning Application in Spring 2018, a number of challenges relating to changes in market conditions and government policy have delayed this submission. Development is still underway, however, and the Council is working hard alongside partners and statutory consultees to develop a strong ‘enabling development’ case to allow the Regeneration Plan to go ahead. Work within the likely Capital Budget available. Deliver the vision and regeneration aims. Respond to business plan findings including opportunities for income generation. Work where possible within the established Masterplan planning principles. The approved Masterplan identified areas for housing development on the periphery of the park (Sydenham Villas and Rockhills). The capital receipts from the housing would directly enable the wider park’s regeneration alongside additional grant funding, which would need to be secured. This funding is separate to that needed for CP NSC. 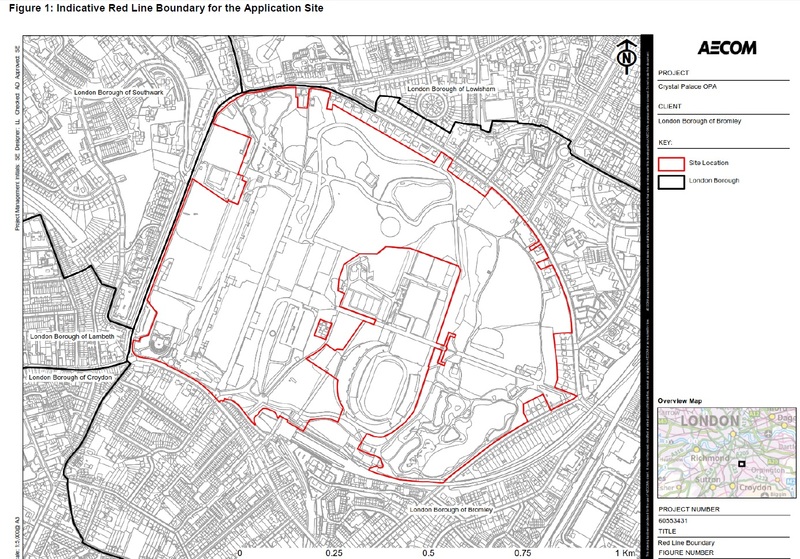 Read the Bromley led wider park 18/00352/EIA planning application for a scoping opinion here. Additionally, in April 2018, Capel Manor College succeeded in a £4.9 million capital expansion funding for a new state-of-the-art education facilities at Crystal Palace. Crystal Palace Park Farm, managed by the College, will benefit from a complete refurbishment, creating new classroom space and enclosures for the animals and other new classrooms and facilities will be created nearby. Click here for Capel Manor news. With diggers already re-building the Crystal Palace Park cafe, uncertainty remains within the NSC area (owned by the Mayor of London on long term lease). 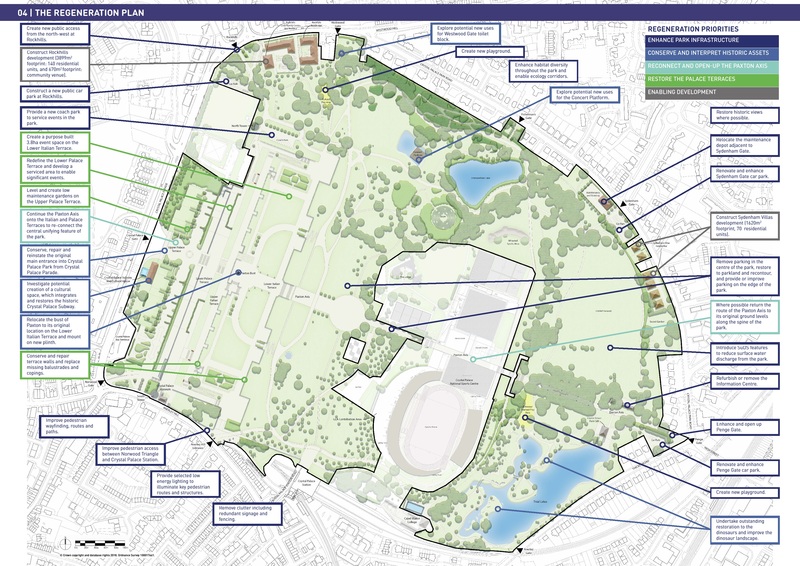 The illustrated CPP – Nov 2017 Exhibition Plans indicates the loss of the 25m pool, and the loss of the indoor track from under high level walkway, and loss of the hockey pitch and other outdoor facilities from the National Sports Centre (“subject to agreement with the Greater London Authority“). 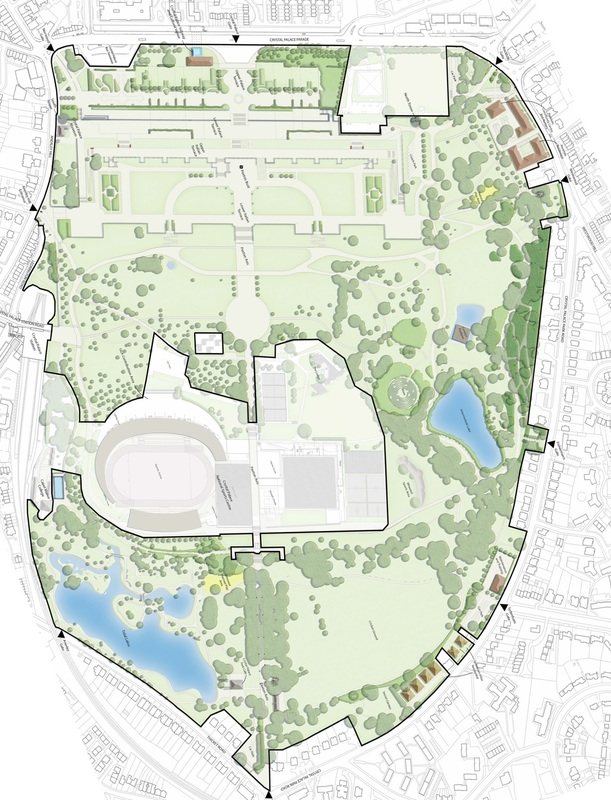 The Mayor’s assessment and re-development of the CP NSC is under time pressure to align to Bromley’s wider Crystal Palace Park regeneration plans. Various changes have been made to 2007 Masterplan. So the planned cricket pavilion facility has been removed. This was expected to be a community facility with sports centre use, a multi-purpose clubroom (with changing facilities), which could also be used for meetings, gatherings and other events. Cricket was one of the first sports to be introduced (as early as 1857) into Crystal Palace Park, and it was considered appropriate to reinforce the heritage of this part of the Park. 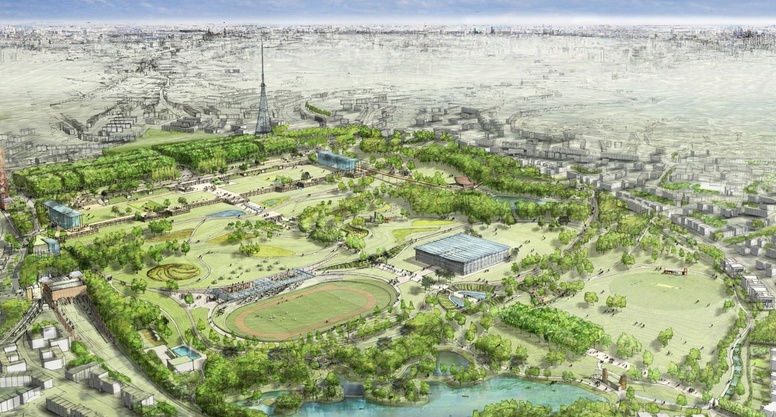 The new reconfigured stadium facilities would be located below ground taking advantage of the topography of the Park, with an accessible green roof, and with outside seating up to 3,000 spectators. The RSC has expected use as a large sports centre, indicative footprint 10,910-14,500 sqm. The car parking total was for up to 383 cars, integrated with tree planting to minimise the impact on the surrounding parkland, and with over-flow parking during major events. It was envisaged that the largest likely events at the Park would be held within the stadium area (for up to 30,000).